Did you know that over 150 bald eagles spend the winter along Hudson Valley waterways? Each winter, between December and March, bald eagles from Canada and northern New York and New England fly south to the Hudson Valley to feed on fish and waterfowl found in unfrozen waters. The bald eagle, which was considered an endangered species prior to 1995, shed its federal threatened status in 2007. Today, biologists estimate that about 150 bald eagles overwinter in the lower Hudson Valley. Every year the bald eagles’ return affirms the continued health of the Hudson River and nearby habitats for wildlife and people. 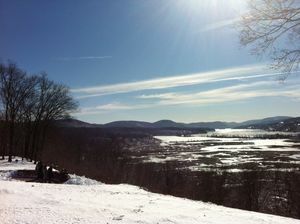 Bundle up and stop by Boscobel Saturday, February 11 from 9am to 4pm (snow date February 12) where you will find breathtaking vistas and viewing opportunities from the Belvedere overlooking the Hudson River. There will be eagle spotters from Constitution Marsh Audubon Center and Putnam Highlands Audubon Society with scopes to assist you and a small fire for hand-warming. Registration is available online at Boscobel.org. Boscobel is located on scenic Route 9D in Garrison New York just one mile south of Cold Spring and directly across the river from West Point. Boscobel is closed January through March. From April through October, hours are 9:30am to 5pm (first tour at 10am; last at 4pm); November & December 9:30am to 4pm (last tour at 3pm.) The House Museum and distinctive Gift Shop at Boscobel are open every day (except Tuesdays, Thanksgiving and Christmas.) For more information, visit Boscobel.org or call 845.265.3638.